Bible History elective classes in the public schools are an opportunity for students to have a viewpoint neutral, foundational study – at no cost to taxpayers – of one of the cornerstone texts of world history, which helps students become culturally literate and better equipped to thrive and contribute to a global world. It is legal to teach Bible History in public schools? Yes. In 1963, the U.S. Supreme Court ruled: It certainly may be said that the Bible is worthy of study for its literary and historic qualities. Nothing we have said here indicates that such study of the Bible or of religion, when presented objectively as part of a secular program of education, may not be effected consistently with the First Amendment. Does Bible in the Schools promote any specific religion or denomination? No. Bible History is a robust and academically challenging course. Since public school Bible History elective classes first started in 1922, the teaching has remained historical and is non-sectarian. Bible History courses do not include lessons related to doctrine, nor do they promote or denigrate any religion. No. Bible History electives are 100% gifted to public schools by private charitable contributions from the community. No taxpayer dollars are used. Who employs Bible History teachers? The teachers are selected and hired by school principals and are employees of the school system. Bible in the Schools does not hire teachers and directs all interested teacher applicants to Hamilton County Schools' Bible History Program Coordinator, Dr. Matt Johnson. What role does Bible in the Schools have? 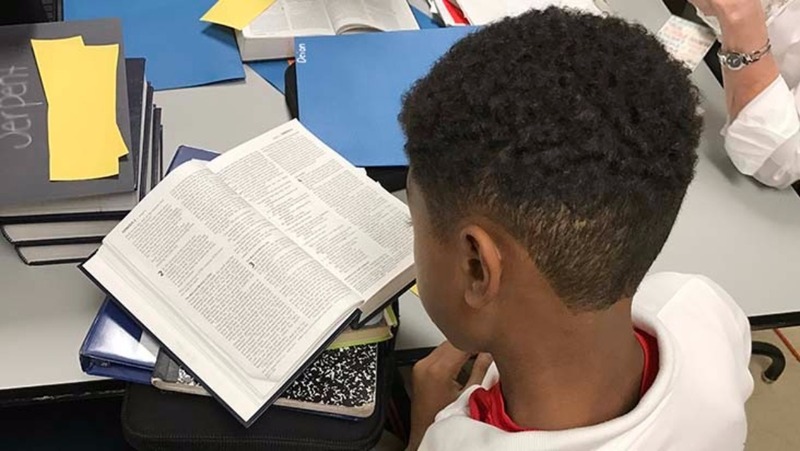 Since no tax funds are used, Bible in the Schools is the conduit through which the community gives charitably to provide Bible History electives to local public schools. Bible in the Schools reimburses the school system annually for the complete costs of running the county-wide Bible History program. Included in reimbursement costs are: teacher salaries, benefits, taxes, teacher professional development training, classroom materials, and the textbooks for all participating schools -- the Bible. What qualifications must a teacher have? 12 credit hours of Bible content from an accredited college or university. Acceptable classes include: Old Testament Survey, Book of James, Major Prophets, Minor Prophets, etc. Classes not accepted: Theology; Biblical Languages; Doctrine, etc. (2) Bible content hours described above, plus college degree major of History/English. It should be noted that candidates with other college degrees may be required to obtain a passing score on a History or English Praxis exam. Candidates without current Tennessee teacher licensure must also obtain full acceptance into a Tennessee Job-Embedded Teacher Licensure Program. Teacher licensure reciprocity is available subject to state policies. Five courses are offered: Genesis (6th grade), Exodus (7th grade), The Life of Jesus -- Based on the book of Luke (8th grade), Old Testament Survey (9th-12th grade), and New Testament Survey (9th-12th grade). What determines if Bible History is offered in a school? School principals request Bible History electives for their school. The school system then consults with Bible in the Schools to inquire if funding is available to cover the comprehensive costs. As funding becomes available through community/donor charitable gifts, a Bible History program is then implemented at a new school. Teachers are selected and hired by the principals of the schools. Prospective teachers may make inquiries at Bible in the Schools. They will be directed to the Hamilton County Schools Bible History Program Coordinator, Dr. Matt Johnson, who will provide assistance with determining if their qualifications align with pre-established state requirements. Bible in the Schools refers all interested applicants to the Bible History Program Coordinator, Dr. Matt Johnson. Can other school districts have a Bible History program? Yes. It is constitutionally permissible to teach Bible History from a historical or literature perspective. Is Bible History like Sunday school or other religious education? No. Bible History courses are academically rigorous academic electives that are for-credit, that count toward a student's graduation requirements. Courses do not resemble Sunday school, teaching doctrine is not permissible, and students optionally select this subject. Bible History elective classes are an opportunity for students to have a viewpoint neutral, foundational study of one of the cornerstone texts of world History , which helps students become culturally literate and better equipped to thrive and contribute to a global world. Are students required to take Bible History courses? No. All courses are electives. Students select Bible History as they would any other voluntary elective such as music, band, or art, etc. How do teachers deal with controversial Bible topics? Teachers direct students back to the text. Lessons are centered around the text of the Bible. Personal beliefs are not discussed. Students are directed to what the textbook (the Bible) teaches regarding various topics. What do students learn by taking Bible History courses? Students learn the history and organization of the Bible. They study early Middle Eastern history as detailed in the Old Testament. They examine the life of Jesus and study history as detailed in the New Testament. Students learn what the Bible says about the nature of God and the nature of man and the narrative of the Bible's account of creation, fall, and redemption. "Bible History means a lot to me because everytime I read a verse in the Bible, I learn something new."